Easyshed is looking to become one of the best in the UK when it comes to garden building merchants. We thought that it was time to give them a look and see what kind of products they have to offer, what their customer service is like and in general just how they stack up against the other garden building merchants. 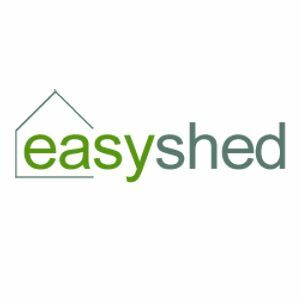 Easyshed is a family based company based out of the UK, they are all about sheds and use their experience to offer a more hands on approach to the world of garden building retail. Their aim is to offer low factory prices and deal with customers on a personal basis. 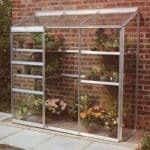 Easyshed is one of the most interesting garden building retailers we have come across. We say this because they are really focussed on garden sheds and that is that. They do have a summerhouse section. However, when you take a closer look these are sheds that could also work as a summerhouse. We find this very interesting and to be honest with you, we like it. This is a smaller, family based business and it is great to see them focus on one main area, in this case, sheds and not getting bogged down with things like pergolas, playhouses and so on. Of course on the flip side of this, there is not as much choice here as you are going to find at a place like Garden Buildings Direct or so on. However, they are upfront with the fact that sheds are in their name and sheds are in their game. They have a fantastic selection of garden sheds. 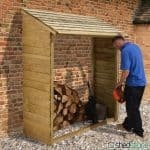 Any kind of shed that you can think of is here They specialise in what they call beast sheds which are really awesome and well made sheds that will stand up to anything mother nature can throw their way, in addition to this they are great for those of you who do have security concerns. Looking at the range of sheds they have is very impressive. 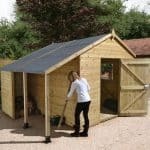 They have some cheaper models like their 4×4 Apex Classic shed which comes in under £400 and then they have more higher end sheds such as the 10×7 Apex Classic shed which is a little under a thousand. We know that the prices for sheds of this high may seem kind of high, but that is because even the cheaper sheds at Easyshed are made with higher quality wood you can have dip treated, tantalized or their own beat wood which is very high end. So if you want a cheap couple of hundred pounds shed, you will not find it here. These guys are all about high quality and long lasting sheds so we would say those who have a tighter budget when it comes to a shed may be out of luck. Each shed, you click on has a ton of different options which is going to bring us to our next point. 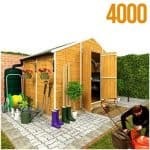 Step by step shed builder is one of the most interesting things we have ever seen from a garden building merchant. Here from the floor joists all the way up to the roofing felt, you can hand pick every single aspect of the shed to make it to your exact specification. It is very impressive to see and for people like us, playing around and making the shed of our dreams is really, really cool. If you know the exact shed you want then this is how you can get it without having to make any sacrifices at all. Of course the more high end the shed, the higher the price tag, but to get the shed you want it can be worth it. When it comes to products unless you know exactly what it is that you want, Easyshed is the kind of company you really want to talk to someone about the kind of thing you need. Ok, so we did talk about the prices that Easyshed are asking before so you know that you will not be getting anything that could be described as cheap and cheerful here. But the thing we will say is that when it comes to high end wood and fantastic craftsmanship, you really cannot put a price on that. Most people will be happy just spending a couple hundred pounds on a shed and taking whatever they get. 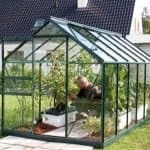 But for a person looking for a higher end shed for their allotment or a shed that is going to give them a lifetime of use. 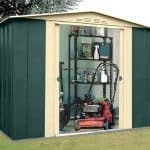 Seeing a shed like their 10×8 Apex Classic shed which at first glance looks like one of their basic models costing over £1000 may think that is very expensive for a shed of this size. But what Easyshed class as a “classic” kind of shed is far higher quality than what a place like B&Q would class a basic/classic shed to be. So while the price is high, so is the quality. You may be wondering what the prices are like if you take the option to build your own shed are. Well as you would expect if you are paying a company to have a hand on approach for each and every aspect of your shed, you will be paying for that time and that care as well as the actual high quality materials. We built a basic, dip treated 8 x 6 apex shed using their build a shed system. We kept everything basic, included a window, but no other extras such as shelving or adding extra height to the shed. The total for this came to £685 which considering the quality of the wood is not a bad price at all, but we can see why some people may balk at the thought of paying this for an 8 x 6 shed. Easyshed has done a good job in making their site easy to use. The homepage has plenty of tabs along the top for their different kinds of sheds like security sheds, beast sheds and of course the build a shed option. If you scroll down a bit more, you will then see pictures of the different kinds of sheds such as beast and security. This gives you a bit more of an idea of what these kinds of products are like before you click on the category and take a closer look. The homepage may look like it has a ton of stuff on it, but they have done a good job in keeping it organised and easy to use. When you click on one of the categories, you then have some extra options down the side where you can pick the size of the shed, what kind of cladding, the floor, and extras such as windows, security options extra height and so on. Even their what at first glance looks like basic sheds have a ton of options that you have to look through. To the average Joe just looking to have a shed to keep their tools, kids bikes and lawn mower in this may seem a bit on the daunting side. But for people who know what they want, we think this way of doing things is great as it lets you know exactly what you are getting. We had a lot of fun designing our own shed on here and while it may sound complicated, it is actually very similar to just picking options for one of their standard models of sheds. Actually, we would go as far to say that designing your own shed is a lot more straightforward than adding a load of options to an already existing design. Thankfully with all the options, it is very easy to get in touch with the people at Easyshed and they seem like a very nice group of people. 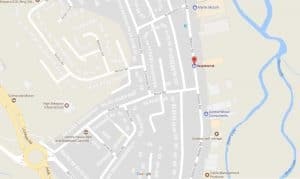 This is good as it can make it much easier to get what you want and know what it is you are getting, we would certainly advise anyone who is interested in one of the sheds, to give them a call and let them know what kind of thing it is you are interested in. They do have an online chat which is something we always like to see. There is a ton of reviews on Easyshed for their products, but they are not done in the way that you would think. When you click on a product such as the 4×4 Pent_B Classic shed, you will notice that there are no customer reviews on that actual product. Now to be fair to Easyshed, we can see the reason for this. You see as the sheds here are designed so that each customer can put their own spin on them, it would be very hard to have customers leave a review for their 4×4 Pent_B Classic shed when it could be different to the one you are thinking of buying. So where are these ton of reviews? Well when you click on something, let’s say their beast sheds section. Down the left hand side of the screen is a reviews section that you can click on. When you do click on it, you have pages and pages of reviews. As of writing there has to be close to 100 reviews on here, but as far as we could tell they are not in an kind of order. It does tell you what each review is for, but finding one for the type of shed you are interested in can be a bit tricky. While all of the reviews are positive, we do like how they allow customers to rate different categories for each shed. So while not an ideal way of handling reviews at least they are on there and some people actually give pretty detailed reviews which is nice to see. While not in the actual reviews section, they do also have a section on the site where customers can leave photos of their shed. We think this is really cool and a good way to show people how a particular shed can look when it is installed. To leave a review you have to get a login from them and you can only do this if you have actually purchased a shed. We like this as it stops people from just leaving silly or really mean reviews when they have not even purchased anything. What Are The People Saying About Easyshed? Here is the part where we put on our detective hats and do a little digging around, Sherlock Holmes style as we look at review sites to see what customers have to say about Easyshed. Going in, we had a feeling it was going to be good as Easyshed actually links to their Trust Pilot page so they are clearly proud of the reputation that they have built up. When reading customer reviews on a review site always try to keep an open mind and do not just go straight for the 1 or 5 star reviews. Trust Pilot should always be the first place you look for online customer reviews as they are the biggest online review site in the UK. We expected their Trust Pilot score to be good, but we were blown away by all the positive reviews customers have left. As of writing there are close to 500 reviews and 90 percent of these are rated at 5 stars and another 6 percent is rated at four stars. That is 96 percent! We are very impressed by this and from the reviews we read, quality and customer service seems to be what people really like about Easyshed so it goes to show that when the quality is high and customer service is good, people are willing to pay a little bit more. The negative reviews that we did read seemed to be from people who had faults with their sheds. Not making excuses for this at all, but at least, Easyshed did respond to these people. Hopefully whatever issues they had did get resolved. No company is going to 100 percent customer satisfaction as things can always go wrong, but 96 percent positive customer reviews is pretty close! We had a really good look online and apart from Trust Pilot, really there is not much if anything in the way of other Easyshed reviews. This is becoming more and more common with the garden building merchants we review as when a customer wants to leave a review, 99.99/100 they will go straight to Trust Pilot. However, if you do want to see more of Easyshed then there are a few ways. To start with they have a Facebook page which is good to see, but we did not see much in the way of back and forth with customers on there. As well as Facebook there is also an Easyshed Twitter Account page which you can actually chat with them on. Lastly, we have something that is pretty cool and that is their YouTube channel which as well as having some cool videos ideal for anyone interested in a shed. Some of the videos do actually have comments from people which can be interesting to read. Hmm, this is a hard one to say. You see Easyshed are all about sheds so we are not going to put them down for not stocking other things like playhouses, greenhouses and so on. But we do feel that the kind of sheds they sell are for people who have at the very least a little bit of knowledge about sheds. A total novice would probably be kind of lost here. But to be fair to Easyshed, they are very easy to get in touch with so those types of customer could always ask questions before they buy which is something we would encourage you to do as there is a lot of choices here, which is not a bad thing at all. The only thing that we would like to see if have product reviews on the actual products. Yes, we said that we understood this would be hard to do as there are so many different customisation options available. But we do feel that this would be better than just having one review section with tons of reviews that you have to look through to find the particular shed you are interested in. We had a lot of fun looking around the Easyshed website. It is certainly more aimed at people who already know a little about sheds and the fact that these guys let you design your very own shed is really cool. This is perfect for people who know exactly what they want as sometimes a stock shed maybe 90 percent great but lacking in one area. With Easyshed, you can make sure every aspect of the shed meets your needs and that is pretty awesome. While the site is very easy to use, for a person buying their first shed, we feel they may be a little overwhelmed and also put off with some of the prices compared to cheaper lower quality sheds you find at some of the other garden building retailers. We really like Easyshed and are actually dreaming up some awesome sheds for ourselves thanks to their build your own shed option. But we would love to hear from you guys who have actually used them. Let us know in the comments below what your dealings with Easyshed were like. Love my shed from these guys and the whole experience from start to finish has been great. Staff are nice to deal with from the team in the office to the fitters who installed my shed for me. Shed is sturdy and heavy duty, you most definitely get what you pay for! Bearing in mind delivery and installation is included for free which a lot of places I looked at charge extra on their ‘cheap’ sheds in similar specs. I love my new BEAST shed! From start to finish i am impressed with this company! The office staff are always happy to help with any questions i had! I was kept in the loop with delivery & timeslots! When the team arrived they had my new shed up in no time at all, i was shocked for such a solid structure! Look no further!!! !